Our Father – The Lord’s Prayer (Tertullian, De orat.) arr. Sherelle Eyles. Our Father is composed in an Aeolian church mode in the key of D minor. Harmonically, it echoes back to the Renaissance period but maintains a modern feel through its use of contemporary rhythms and vocal chord spacing. This piece is based upon the image of the ‘Pieta’, of Jesus Christ prior to his resurrection, which is both joyful, due to salvation, and sorrowful. The middle section ‘And lead us not into temptation’ is effectively in Recitative style, an operatic form which ‘tells the story’. The emphasis is in the text and rhythm and less so on the melody, which centres on the Tonic and Dominant. 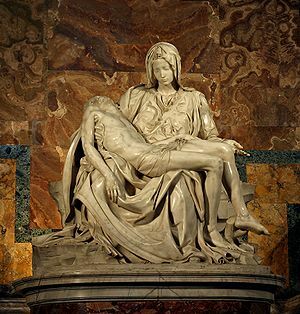 The final Amen is a Lament, which in musical terms represents ‘tears.’ The tears may either be of joy, happiness or tears of crying, as in the beautiful image of the ‘Pieta’. Published in Young Voices of Melbourne Choral Series and recently performed by Junior Gondwana (Sydney Children’s Choir) at the Summer Music Camps January 2013, Our Father is an arrangement of the Lord’s Prayer composed in 2010. It is suitable for Upper Primary School, Secondary School or Adult Choirs and is currently arranged for SA and Piano. This piece was sung by the Hillcrest College Choir Bella Voce, winning the Under 12s Choral Championships at the Canberra National Choral Eisteddfod 2012, conducted by Jenny Moon.